Understanding the relationship between a lifter’s clean and how it correlates to their best front squat can help coaches and athletes better determine whether athletes have limitation in strength or more with the components of the clean. 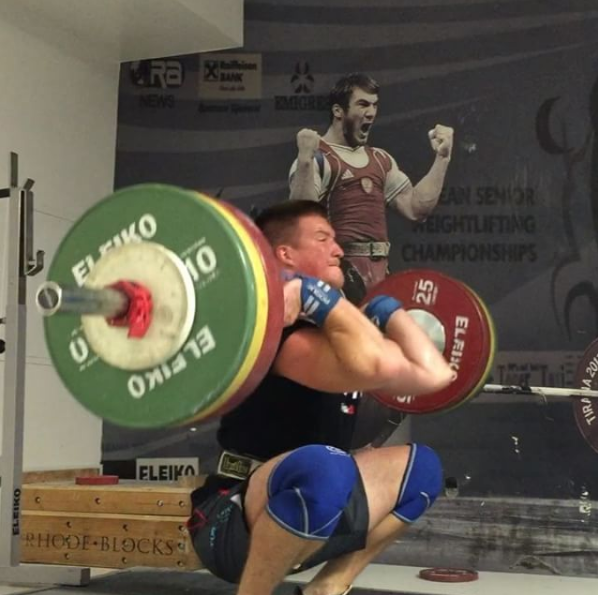 According to USA Weightlifting coach and Catalyst Athletics coach Greg Everett, a proficient weightlifter should be able to clean 85-90% of their front squat max. Ursula Garza, an accomplished international lifter, coach, and mastermind of Texas Barbell, also suggests national level athletes often can clean 87-90% of their front squat max. The ability to clean at those percentages, in relation to their front squat, suggests that the lifter has a proficient understanding and mechanics of the movement, and therefore should work to increase performance through similar means that they have been following. 1. Your clean is within the percentages above in relation to your front squat, therefore suggesting you have proficient technique and explosiveness. Increasing strength and explosiveness through weightlifting training will further enhance performance. 2. Your clean is below the percentages above in relation to your front squat, therefore you need to further address the clean and it’s various components to increase performance. Poor Pulling Strength and Explosiveness: If a lifter’s power clean is below 85% of their clean, pulling strength and explosiveness could very well be the issue behind a lifter failing in their cleans. The inability to accelerate the barbell high enough limits a lifter’s ability to get under the barbell to find the catch positioning. Not Staying “Connected” to the Barbell: Staying connected to the barbell during the turnover phase in the clean is critical to not allow the barbell to “crash” onto a lifter. If a lifter finds that a weight comes crashing down on them in the catch, they need to program certain lifts to develop a better catch position. Confidence Issues: Poor confidence and overthinking can slow an athlete down, and alter their courage under the barbell. Whether the fault stems from hesitations from previous injuries, or lack of confidence, coaches and athletes should take the time to address weaknesses to enhance a lifters confidence on the platform. Lack of Balance and Awareness: Often, cleans are missed out front or come crashing into a lifter because of poor balance over the foot during the movement. The barbell should follow an “S” shape to ensure close pulls and clean catch positions. Coaches and athletes can determine faults by recording lifts and slowing them down with pause variations to develop great awareness and positioning in the clean. Limited Mobility: Lack of mobility in the wrists, shoulders, thoracic cavity, and lower extremities can hinder a smooth catch position in the clean. Performing high velocity movements with finite control demands mobile movement. Poor joint mobility may alter the rack positioning in a catch phase or rounding in the squat, all of which can limit an athlete’s performance. In order to fully isolate the movement pattern issue, athletes and coaches need to look at every lift from various viewpoints in order to uncover the issue(s). Implementing specifically technical exercises to teach lifters and correct faults will increase an athlete’s ability to progress throughout their training. These clean variations develop a lifter’s ability to stay connected to the barbell at the end of the pulling phase. By starting the lifter in the high hang position, lifters should focus on finishing the pull and pulling themselves under as thee meet the bar into the front rack position. This clean variation does not allow lifters to move their feet to increase the awareness and balance thought the movement. Often, lifters who rock back and forth in a clean, or who are jumping forwards or backwards in the catch, can benefit from this exercise. This segmented approach to the clean is a great way for lifters to isolate a particular phase that is incorrect. By pausing in the middle of the pull, the lifter gains positional strength and awareness, allowing them to not only gain confidence, but also a better understanding of staying balanced throughout the pull. The best plan of attack is to video your lifts, and look at where your numbers lie in relation to your squatting and pulling strength. From their, a coach can assess and customize a program based upon your needs.